When the 2018 NHL Prospect Tournament kicks off later this week, the Detroit Red Wings will have officially begun their 2018-19 season. 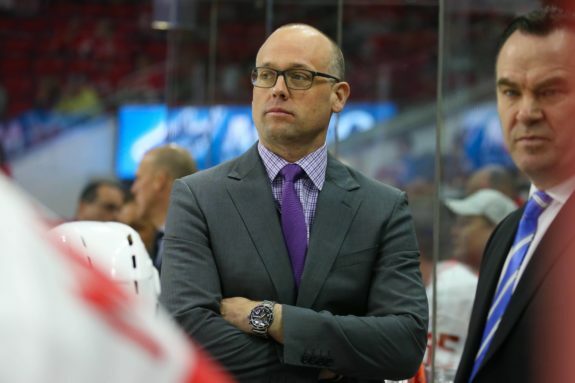 The future of the organization will be on display as Filip Zadina, Michael Rasmussen, and Dennis Cholowski are set to take part in the showcase. While the rebuild chugs along, the Red Wings could use strong seasons from their top prospects. The sooner they develop into NHLers, the sooner the organization can return to glory. So with the tournament right around the corner, let’s launch into the new season with one thought for every Red Wings prospect, starting with the franchise’s 25 best prospects. 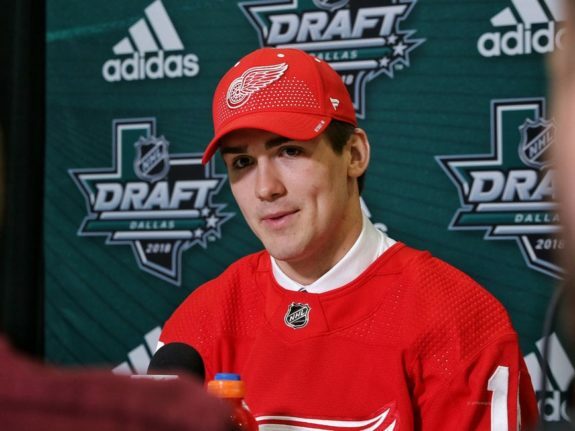 Filip Zadina (RW) – With no Henrik Zetterberg—at least for the beginning of the season—expect the Red Wings to keep Zadina on the NHL roster to see what he can do against the world’s best. The kid is hungry and could earn some Calder Trophy consideration if he holds down a roster spot all season. Joe Veleno (C) – I wouldn’t be surprised to see Veleno among the last cuts toward the end of training camp. It won’t be long until the center joins the Red Wings on a full-time basis. Michael Rasmussen (C) – Last year, Rasmussen scored four goals from in tight during the preseason. While he may not score as much this preseason, he’ll be a force down low and earn a spot on one of Detroit’s two power-play units once the regular season begins. Jonatan Berggren (RW) – Though he won’t be at training camp, Berggren is a player to keep an eye on after drawing comparisons to Filip Forsberg. He has mid-first-round talent despite falling to the Red Wings at No. 33. Filip Hronek (D) – I fully expect Hronek to take over one of Detroit’s power play units by season’s end. In the meantime, he needs to make his case for regular ice time. Dennis Cholowski (D) – With Robbie Russo, Dan Renouf, and likely one of Hronek or Joe Hicketts not with the Griffins next season, there’s a lot of ice time up for grabs on the blue line. Cholowski could be an impact player from the start on what looks to be a stacked Grand Rapids team. Jared McIsaac (D) – He’s not the flashiest blueliner, but I’d expect McIsaac to make Canada’s World Junior Championship team this winter after a solid summer showcase. Evgeny Svechnikov (LW) – Though he’d prefer to play in the NHL, another year with the Griffins wouldn’t hurt Svechnikov. He could follow the example set by Gustav Nyquist and Anthony Mantha and dominate the AHL, forcing the Red Wings to recall him. Gustav Lindstrom (D) – Already on the top-pairing for Frolunda (SHL), Lindstrom could develop into a top-four defenseman soon for the Red Wings. His offensive game is coming along nicely. Vili Saarijarvi (D) – Like Cholowski, having a regular spot in the lineup, consistent ice time against quality competition, and some power-play time would do wonders for the the Saarijarvi’s development. Joe Hicketts (D) – The diminutive blueliner may not make the Red Wings out of training camp, but it won’t be long before Hicketts is up in the Motor City for good. Moving Trevor Daley or Nick Jensen for draft picks is inevitable. Filip Larsson (G) – Now at the University of Denver, Larsson could start right away as a freshman – last year’s starter graduated this spring. But, it’s up to the Swedish netminder to lock down the No. 1 job first. Givani Smith (RW) – The Griffins will have a deep forward group, so Smith will need to fight for ice time early on. The Red Wings can’t afford to have the former second-round pick go the way of Zach Nastasiuk and get lost in the minor league shuffle. Keith Petruzzelli (G) – The towering netminder needs to take charge and earn the starting role for Quinnipiac University. Last year, Petruzzelli split time with Flyers prospect Andrew Shortridge before closing out the season as the starter. David Pope (LW) – It will be interesting to see how Pope stacks up against men in his first training camp. College players are not allowed to take part in professional camp, so there may be a little bit of a learning curve as the six-foot-three winger adapts to the faster style of play. Alec Regula (D) – With Evan Bouchard likely gone from London, Regula will have the opportunity to play top minutes with newcomer Adam Boqvist, whose size and style of play resembles that of Filip Hronek and Vili Saarijarvi. However, if Bouchard returns for another OHL season, Regula will likely find himself behind the two 2018 first-round picks and missing out on key development minutes. Libor Sulak (D) – If he has another strong training camp and preseason, Sulak could be a darkhorse candidate to make the Red Wings. His 2017-18 NHLe stats certainly add fuel to the fire. Kasper Kotkansalo (D) – Stout defensively for a stacked Boston University team, Kotkansalo should take a step forward offensively during his sophomore season. The blueliner skates well and makes smart plays in the defensive zone. Kaden Fulcher (G) – I would not be surprised to see Fulcher start the year in the ECHL. There, he’ll get to play and be mentored by minor league veteran Pat Nagle, while Harri Sateri and Patrik Rybar compete in Grand Rapids. 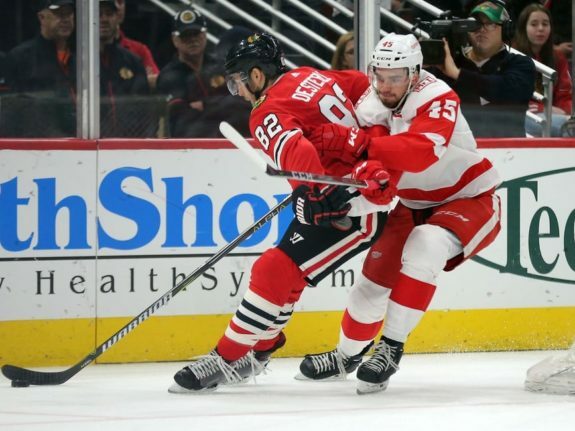 Dominic Turgeon (C) – After he is fully recovered from the serious blood clot issue and can re-acclimate to game speed, the Red Wings should give Turgeon a look at their fourth-line center role. If there’s outside interest in Luke Glendening, moving Turgeon into his old role would be an upgrade offensively. Seth Barton (D) – Committed to play at UMass-Lowell for the 2018-19 season, Barton could step into an impact role right away with the university’s top three defensemen all playing professionally now. Zach Gallant (C) – A former third-round pick from 2017, Gallant needs to stay healthy for a full season; injuries have already cost him quite a bit of development. Lane Zablocki (RW) – Like Gallant, Zablocki could benefit from some stability. The forward was traded twice last season and only scored one goal in his last 25 regular season games. Jesper Eliasson (G) – Sweden has some quality U20 netminders and Eliasson is one of them. Detroit’s goaltending prospect could even make their World Junior Championships team this winter. Ryan O’Reilly (RW) – Keep an eye on O’Reilly over the next few years. He’ll play one more year in the USHL before joining Larsson at the University of Denver, and he could develop into a goal-scoring threat for the Red Wings. Jack Adams (RW) – Look for Adams to follow in Pope’s footsteps and become a major contributor before his college career is over. He’ll certainly improve after only scoring four goals as a freshman. Victor Brattstrom (G) – Already 21-years-old, the massive 2018 draft pick will play for Timra (SHL) this season and hone his game for a few years. The Red Wings prefer to over-ripen their goaltending prospects overseas or at the NCAA level since they typically reach their prime later than forwards and defensemen. Christoffer Ehn (C) – Before mono ended his 2017-18 season early, Ehn was expected to join the Griffins for their playoff run. Now, the forward is healthy and will play in Grand Rapids’ bottom-six as a slick-skating energy player who can also contribute to the penalty kill. Cole Fraser (D) – Unless he significantly increases his offensive production, Fraser will more than likely not receive a contract offer before next year’s draft. Brady Gilmour (C) – If Gilmour can avoid the injury bug and pick up the slack offensively, he could earn a contract from the Red Wings. Otherwise, he’s another non-tender candidate. 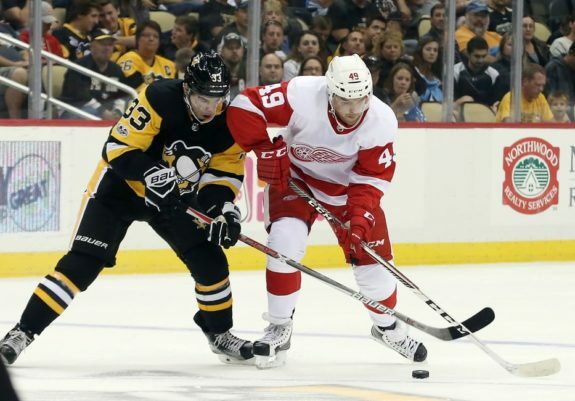 Axel Holmstrom (C) – It would not be surprising to see Holmstrom dress for a game or two with the Red Wings this season. He’s not NHL-ready by any means but would bring some energy to the bottom-six and does have a knack for timely scoring. Patrick Holway (D) – Now a junior, expect Holway to play on Maine’s top pair this season and continue developing his already-strong offensive skills. Alexander Kadeykin (C) – Though the Red Wings own his rights, don’t expect anything from Kadeykin in the near future. He’s looking like a career KHLer at this point. Otto Kivenmaki (C) – Playing alongside No. 3-overall selection Jesperi Kotkaniemi, Kivenmaki has had an impressive summer for Finland. If Kotkaniemi stays in his native country for the 2018-19 season, he and Kivenmaki will be teammates once again with Assat of Finland’s Liiga. Alfons Malmstrom (D) – Drafted in 2016, the blueliner doesn’t project to be an NHLer, at least not for a while. Malmstrom has the benefit of playing overseas for a couple more years before the Red Wings need to make a decision on him. Chase Pearson (C) – Quietly flying under the radar, Pearson could explode for a career season with a young Maine team as a junior. He’s improved every year since being drafted and is already a captain for his the university. Chase Perry (G) – Like Fraser, the Red Wings will likely pass on offering Perry a contract this spring considering his lack of development and the many goaltenders ahead of him in Detroit’s prospect pipeline. Patrik Rybar (G) – After making Slovakia’s Olympic team and playing for their World Cup squad, Rybar will transition to the North American game. If he can develop into a quality goaltender for Grand Rapids, Rybar could potentially serve as a stopgap solution until Detroit’s top goaltending prospects arrive on the scene in a few years. Dylan Sadowy (LW) – Chances are, this is Sadowy’s last season with the organization, given Grand Rapids’ depth. Malte Setkov (D) – Though outside of the top 25 at the moment, don’t be surprised if Setkov plays his way into consideration before the season ends. Joren van Pottelberghe (G) – The fourth-round pick from 2015 will once again split HC Davos goaltending duties with Devils prospect Gilles Senn in Switzerland’s top league. Look for van Pottelberghe to come to North America full-time next year. Reilly Webb (D) – With one CHL goal to his name, it would be hard to imagine the Red Wings offering Webb a contract this spring considering their pipeline, upcoming picks, and their present amount of contracts (42/50). Which Detroit Red Wings prospect intrigues you the most? Share your thoughts below.